Part A of the Implementing Regulation specifies rules for handling oily and greasy waste arising from operating the vessel. Wastes occurring in the engine room are specifically addressed: i.e. 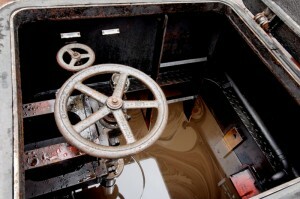 used oil, bilge water, used grease, used cloths, used filters and similar wastes. 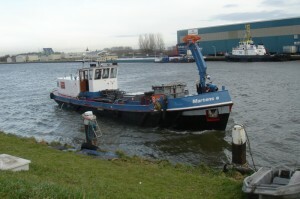 Such wastes are generally the same for all inland vessels. The amount of the wastes occurring depends on vessel use: a greater amount occurs on vessels used frequently than on those used less often or little. In the engine room, the technical equipment and the condition of the machinery are also factors affecting the amount of waste. Consequently, inland vessels vary in terms of how frequently such wastes have to be deposited, yet every ship inevitably has to dispose of them several times a year. A network of reception stations is established in every country in order to provide the shipping industry with the best possible support. The system consists mostly of oil separator vessels that dock onto vessels during passage, whereas onshore reception stations do exist in isolated cases. The network is more developed in waterway regions with heavy shipping traffic than in remote areas navigated by few vessels. In certain cases, wastes can be deposited on request at a reception station not specifically designed for the inland shipping industry (e.g. tank trucks). It is necessary to consult with the national institution responsible. The deposit of wastes is subject to certain rules. For example, not every kind of bilge water or used oil can be deposited, nor can just any amount of waste. The most important rule is that the substances must be of a sort that is produced during normal activities of the operation. This means that waste quantities arising from a shipwreck cannot be accepted unconditionally, for instance. Wastes that are mixed with chemicals cannot be deposited free of charge either, since treating such wastes incurs substantially greater expense compared with “normal” bilge water. Waste in such cases can not be considered as oily waste but may be deposit against payment of a fee. The deposit facilities obviously require funding as well. This is provided based on the “polluter-pays” principle. The party causing (or potentially causing) waste in this case is the shipping industry. While the relevant types of waste occur on all ships, both the shipping industry and the environment stand to benefit from a well functioning waste collection system and easily accessible facilities. The associated costs are consequently charged to the shipping industry. Specifically, as of 1 January 2011 every ship pays a disposal fee of €7.50 per 1000 liters of (tax-free) gas oil bunkered. The fee is the same in every contracting country and for every vessel and entitles ships to deposit wastes free of charge. The SPE-CDNI is a software solution the purpose of which, as an electronic payment system , is to handle Part A of the Convention on the collection, deposit and reception of waste produced during navigation on the Rhine and inland waterways (CDNI), which came into force on 1 January 2011. The SPE-CDNI is in active use in six countries (France, Germany, Netherlands, Belgium, Switzerland, Luxembourg). It covers the entire inland navigation fleet within the scope of the CDNI: approx. 16,000 vessels, 70% of the European fleet, 500,000 transactions per annum.